The object here is the program for the musical Corn. The program is archived in the William Harris Papers at Marymount Manhattan College (Brown 2001, 4). This program is the image selected for my AS-L project because Corn’s theme is Vincentian compassion for all marginalized people. This AS-L project gives voice to those in theatre who are misunderstood and often not heard from. Mr. Harris’ expert critique about Corn helped fill the seats. Harris embraced difference and appreciated Ludlam’s genius and the extraordinary performances in Corn. Corn won an Obie award as a critically acclaimed play that propelled Ludlam’s career forward. The information below takes the readers on a tour of one evening with theatre off-Broadway critic William B. Harris. Marymount Manhattan College is known for its dance and theatre programs and it is the perfect location to archive the William Harris Papers. Mr. Harris went to the theatre at One Sheridan Square Playhouse to tell the world about Corn in 1978. The Chelsea Playhouse Theatre was later named after Ludlam along with the street in front of it. Ludlam influenced people within the gay community and anyone else open to his unique artistic style. Ludlam gives meaning to the country singer Lola’s struggles to reconnect with her troubled past. The struggles that Lola faced are found in amusing songs and dances (Harris 1978, 1). The main character Lola overcomes exploitation from a greedy Manager to showcase Corn’s social justice themes (Edgecomb 2017, 17). The play features feuding families and images of Americana. Corn’s message is to encourage universal love and peace (Kaufman 2005, 25). In many ways their lives intersect because Ludlam created plays that helped people overcome life’s obstacles. Meanwhile, Harris wrote his reviews to bring attention to Ludlam’s quest. The Vincentian philosophy involves helping others in order to deepen our faith. It is especially important to stand up for people who face persecution due to some aspect of their identities. Playwright Charles Ludlam wrote Corn to provide the audience with a parody about social justice issues (Ludlam 1992, 3). Ludlam’s plays routinely feature themes related to sexuality and acceptance of others. Brown, Mary. 2001. “William Harris Papers: Archives.” Marymount Manhattan College, http://www.mmm.edu/offices/library/archives.pdf. Edgecomb, Sean. 2017. Charles Ludlam Lives, Michigan: University of Michigan Press. Harris, William. 1978. “As Corny as Kansas in August and Better.” The So Ho Weekly News. Kaufman, David. 2005. Ridiculous: The Ridiculous Life of Charles Ludlam, New York: Applause Books. Ludlam, Charles. 1992. Ridiculous Theatre: Scourge of Human Folly. New York: Theatre Communications Group. 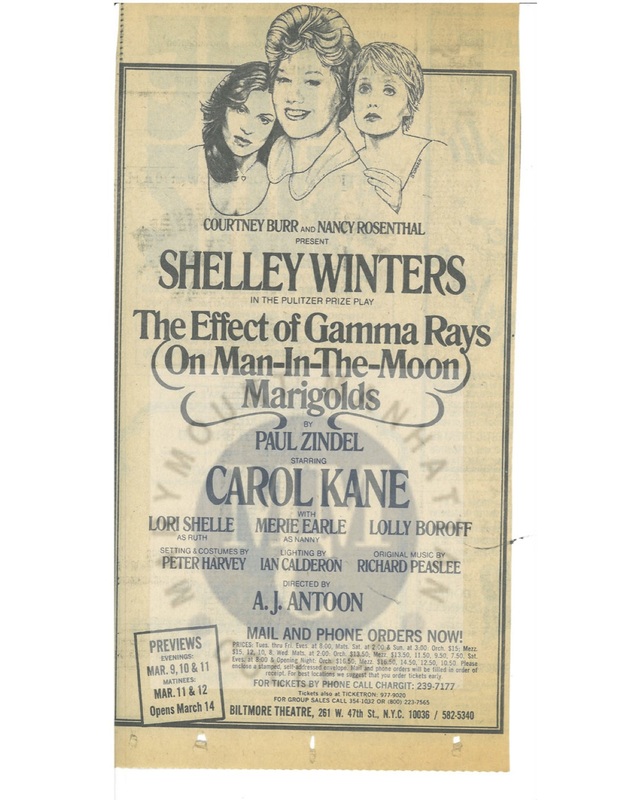 The Effect of Gamma Rays On Man-In-The-Moon Marigolds was written by Paul Zindel. His novel received a Pulitzer Prize in 1964 and eventually became a popular Broadway performance. Some of the advertisements and review clippings from various Broadway performances of the play are archived in the William Harris Papers at Manhattan Marymount College. An impressive collection of 96 scripts, 4,450 folders of clippings and a collection of photographs gathered by Mr. Harris during the decades of the 1960s to the 1990s (Manhattan, 2016).